An Entrance Deck with whimsical painted poles and repurposed maritime bollards to create a distinctive gateway for the pier. Located just off the future trail extension, this space serves as a resting spot for those using the trail and as a place where shopping center visitors can quickly experience the Pier Park. A Tree Canopy that begins to conceal the parking lot and traffic to the west. These trees serve as a threshold, marking that visitors have crossed into a new environment. Along the southern edge of the pier, visitors will find a number of picnic tables which can be used for casual meals or table-top games. The Aquatic Cut, 4.5’ deep cut into the pier surface allows water to filter up through the lower wood deck to reveal the semidiurnal tidal activity of the Delaware River. Filled with native, aquatic plants, this space will be a focal point for educators and curious visitors, creating a microcosm of the Delaware River’s pre-industrial ecology. The end of the pier features an Angled Lawn for lounging and sun-bathing. 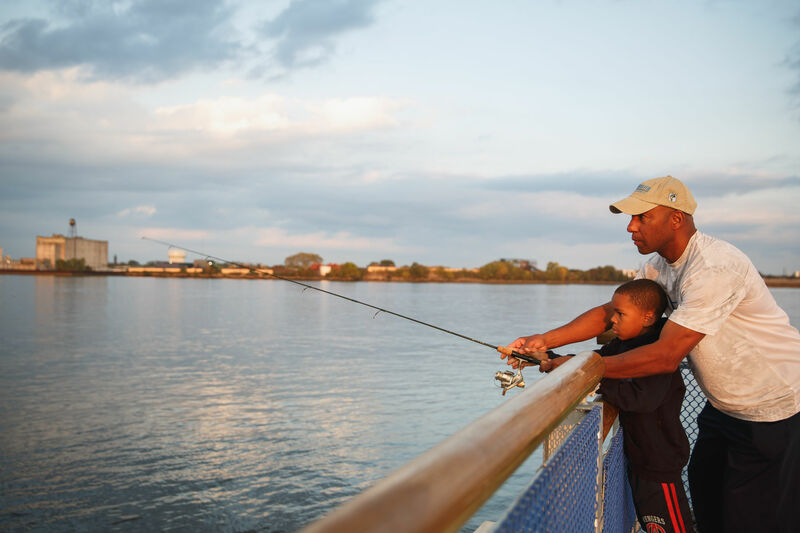 With proximity to the water and restored concrete paving, the Water-Side Walk and the open Pier Terminus supports a variety of events and activities such as recreational fishing or gathering to watch holiday fireworks. Custom-designed wave-shaped benches create a unique and distinctive park element that visitors will remember long after they’ve left.